The first parliamentary elections since 2000 will be held in Azerbaijan on Sunday. For those looking for extensive coverage should point their mouse to Radio Free Europe’s “Azerbaijan Votes”. There you will find up-to-date news along with an archive of articles on Azeri politics from the last few months. I am far from an expert on the political situation in Azerbaijan and Radio Free Europe provides a helpful timeline that explains events all the way back to October 2003. Many watchers of the region doubt the elections will be fair. Things started to get real heated when former parliament speaker and leader of the opposition Democratic Party of Azerbaijan (ADP) Rasul Guliev decided to return to Baku after living in exile in the United States since 1996. He vowed to participate in the upcoming elections. The Azeri government warned that Guliev would be arrested if he entered the country. Guliev has been charged with embezzlement. Charges he claims, and probably are, politically motivated. When Guliev learned that the Baku airport was surrounded by troops waiting to arrest him, he had the plane turned around. The threats against the ADP didn’t stop there. Last Tuesday, Azeri authorities brought criminal charges against ADP deputy chairman Natiq Efendiyev for planning a coup and instigating mass unrest. Then on Wednesday, four alleged coup plotters appeared on prime time Azeri TV in a spectacle that harked back to Soviet times. The “plotters”, which included former Finance Minister Fikrat Yusifov; Fikrat Sadyqov, the former head of Azerbaijan’s state-controlled Azerkimya petrochemical company; former Health Minister Ali Insanov; and former presidential administration official Akif Muradverdiyev, admitted their plan to overthrow the Aliyev government. Yusifov was arrested hours before Guliev’s supposed arrival and his confession led to the arrest of the three others. Reports say that 13 other government officials, business leaders, police officials, and cabinet ministers have been held for the last two weeks on charges of plotting a coup, possession of weapons, embezzlement and corruption. This crackdown hardly bodes fell for free and fair elections, but few figured that was a possibility anyway. Mikhail Vladimirov of the Moscow News wonders if this “cliff-hanging thriller” will spark “colored” revolution in Azerbaijan. After all, he writes, “the tradition that has evolved in the post-Soviet states, presidential or parliamentary elections are an excellent opportunity for regime change.” Given the political tension that has been developing over the last two months, the situation is certainly ripe. If “revolution” does break out, it will probably follow the now predictable pattern of declaring the elections rigged, the people fill the streets, the international community putting pressure on the regime in power, and finally a peaceful compromise is reached on the transfer of power. Revolution reissued and repackaged. However, this time things might be different. Vladimirov notes that the Aliyev government didn’t passively sit and watch their power evaporate as their Ukrainian, Georgian and Kyrgyz counterparts did. In a series of preemptive strikes against the opposition, the Aliyev government, as narrated above, neutralized its opponents. 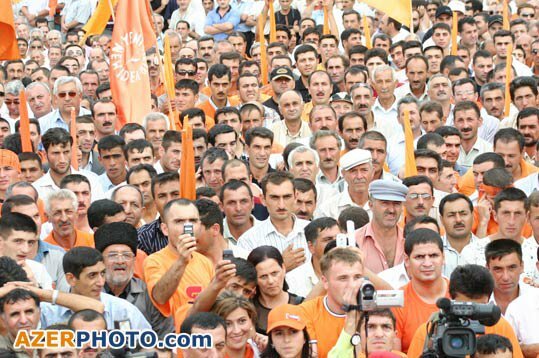 The potential Azeri “colored revolution” was left without a leader with Guliev barred from returning. Still one wonders further: is this the only path to “democracy” in the former Soviet Republics? Or is it how those in the West, especially the US favors it. It should be noted that all three “colored” revolutions have been pro-Western, and specifically pro-US. One can’t forget the geopolitical and petrol importance Kyrgyzstan, Georgia, and Azerbaijan in the United States’ long term interests. I am not suggesting that the US is behind these “revolutions”, though evidence has shown it certainly gave them political, if not monetary support. This is more about the politics of democracy, and how on the surface, one is apt to support the opposition because those in power look so bad. But is this really a struggle of good versus evil? Or is it more about how “democracy” frequently can and is used to bolster the moral authority of one side over another? I’m afraid that most of us are cynical enough to understand that it is not whether the elections are fair; it is about whether the right side manipulated them and public and global opinion enough to win. In the terms of the specifics of Azeri politics, I don’t know enough to say. But there seems to be a familiar pattern brewing in the former Soviet Union. The only question is whether these “democratic revolutions” are really generated from below and within those nations, or are they simply machinations of those above and outside. If it is the latter and not the former, the “colored revolution” will quickly fade into the drab hue of politics as usual.